Navigation: Home » Economics » Early Retirement: How Common – Or Rare – Is It? Early Retirement: How Common – Or Rare – Is It? In a recent post, we argued that 55 years old as the early retirement age cutoff in America. In this post, we’ll look at how rare early retirement is in the US. As a preview, 24.29% of current living retirees report retiring before age 56. One way to calculate early retirement is to… ask current retirees when they retired! Even with the categories counted, roughly a quarter of all retirees recounted retiring at age 55 or before. A mere .47% and .79% of retirees retired in their early and late 30s, respectively. Note that although the numbers above are accurately portrayed, this probably isn’t the best measurement. Consider: A 90 year old may recall retiring at 45 – but that scenario doesn’t speak to one’s ability to retire early in the current economy. The next couple of sets look at the number of Americans per age group who retired early and are currently retired. Another way to gauge early retirement is to look at how old retirees are today. As we mentioned, economic conditions change. A fairer view of early retirement might come from people who are living as early retirees today. As we discussed in our post on how Americans pay for retirement, some folks take exception to “self-labeled” forms of retirement. 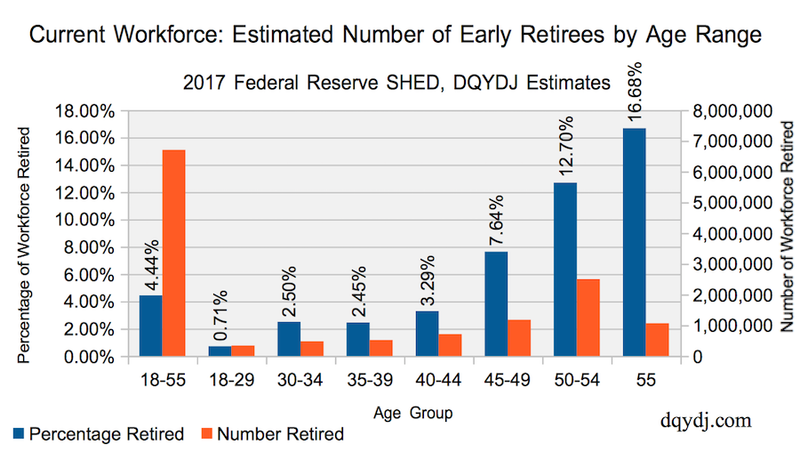 This section’s classification is the survey’s strictest – and is reflected by only 3.71% of 55 and youngers being early retirees. The next section repeats the same methodology except it allows respondents to self-label as retired. Along with labelling respondents, there was also a question allowing respondents to self-select as retirees. It significantly changes the results; there are enough (super?) extreme early retirees that we are able to look at 18-29 year old retirees. The eye-catching age group here is the – after weighting – 340,000 Americans currently retired before age 30. Also of interest: there are another 1,000,000 Americans who retired before 40 (significantly more than we expected). Due to the timing of commonly available government benefits, early retirement (usually) requires considerable resources or alternative streams of income to stop working. There’s – of course – some controversy over exactly what the early retirement age really is. We like using 55 years old as our cutoff; early retirement there is a rare thing in America but not unheard of. To us, the most interesting number was of self-classified living retirees in America. 24.29% retired at age 55 or earlier! Interestingly, 1.38% of respondents reported retiring by 30. Those numbers don’t match the current snapshot, so the economic stories (and health?) of those retirees must be interesting tales. Any numbers stick out to you? Are these numbers on early retirement rarity roughly where you’d expect? 11% of people don’t know when they retired? Thats likely confusion about the definition of retired as much as anything I’d bet. I’d also bet some of the younger people who are retired are not retired in the traditional definition. For example a stay at home person with a working spouse might decide they’re retired. By my math, approximately 132% of them. Yeah, it’s tough to generalize, but with individual responses you do see some funkiness. 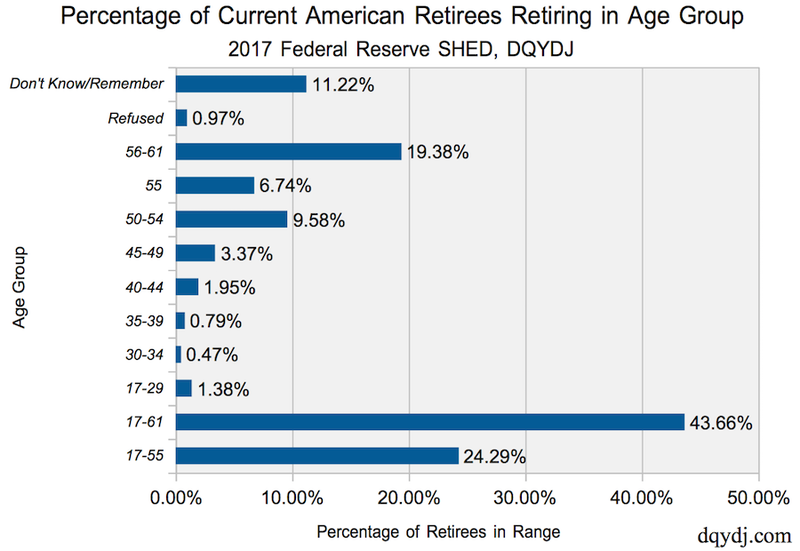 In the last post you can see that a number of retirees are funding their retirement… by working (their response, not the Fed’s). Not sure how to take that, heh. People say things about themselves for all sorts of reasons. Are we seriously going to believe how a twentysomething responds on a government survey? I’m inclined to think these folks are just making a statement about the capitalist system and their intention to drop out of it altogether. Or maybe they’re being “ironic” and just see it as a joke. Or maybe they’re earning money through illicit means. Even if true, someone that young cannot possibly mean the same thing by “retirement” that you or I (at 67) do. They have their whole life ahead. At some point things will change and they will find themselves working. Even the upper one-tenth of 1 percent may eventually become bored and decide to do something useful. I’m sure there’s some shenanigans in some responses, but the Federal Reserve is known for running high quality surveys (of course, the star being the Survey of Consumer Finances). I think you can better bank on the Fed classified statistic than the self-declared though. And an interesting note – one person responded to the ‘When did you retire?’ question with 17 years old. The majority of people under 50 won’t be able to retire that early. The increased costs associated with health care and retirement savings, things that employers used to pay more of, as well as higher costs for college, will make it harder for people to save enough than in decades past. Obviously there are still quite a few examples of early retirement stories, but I think for each one of those, you’ll have 1-2 people that will probably end up retiring at the age they’d originally planned, or even delaying retirement. Tough to say, but the instant snapshot appears to show fewer 50 year olds retired as a snapshot than you might expect from the retirees giving ages as a whole. Of course: can of worms… survivorship bias, forgetting ages, giving the wrong age, etc. A good # of the young people under 30 years old who say they are “retired” could simply be born rich. 0.7% of the population is likely to be rich due to inherited wealth. There are also some small % of people who legitimately retire independently at that age. One ex NFL player comes to mind. Pro athletes are something like 0.01% of the population. Throw in actors, models, authors, etc and you’re probably covering 0.1% of the population. With those types. A lot of them could/do end their careers early. And if twitter is any indication there are literally 100’s of millions of bloggers who’ve retired in their early 20’s after paying off 7 figures of student debt. My thoughts exactly. The 0.7% of people born rich could legitimately be considered retired, and I wouldn’t count on them taking a job that pays money just “to feel productive.” It’s much more likely to find them on an (unpaid) mission trip, or something of that sort. Last I knew, full time unpaid charity work still counts as being retired (as much as that definition actually means anything). That would be a hilarious wedge to drive into the retirement debate – if you never really worked, can you be retired? Or does retirement necessitate having a full time job at one point? My neighbor is in her early 50’s and considers herself “retired”. However, her husband still works. I’m wondering if this makes up the majority of the early retirees these days. I would be interested to compare these numbers to the wealth percentages and see if the early retirees are also the top 1% of net worth people. That group to me, would make sense to retire early and be able to live off the passive investments that they setup. Not sure how else you could officially retire and still live with any kind of expenses and also keeping up with inflation.